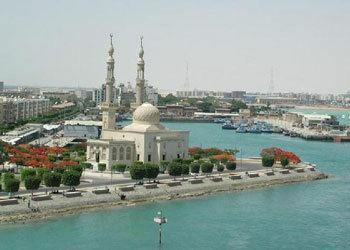 Suez (Arabic: السويس‎‎ as-Suways ; Egyptian Arabic: ‎‎ es-Sewēs, el-Sewēs [esseˈweːs]) is a seaport city (population ca. 497,000) in north-eastern Egypt, located on the north coast of the Gulf of Suez (a branch of the Red Sea), near the southern terminus of the Suez Canal, having the same boundaries as Suez governorate. It has three harbors, Adabya, Ain Sukhna and Port Tawfiq, and extensive port facilities. Together they form a metropolitan area. Railway lines and highways connect the city with Cairo, Port Said, and Ismailia. Suez has a petrochemical plant, and its oil refineries have pipelines carrying the finished product to Cairo. The Ayyubid sultan of Egypt, Saladin, fortified both Kolzum and Suez in to defend Egypt's eastern frontier from Crusader raids by Raynald of Chatillon. Between 1183-84, Raynald had ships stationed in the Red Sea to prevent the Ayyubid garrison at Kolzum from accessing water. In response, Saladin's brother al-Adil had Husam ad-Din Lu'lu build a naval fleet which sailed to the southern port of Aidab to end Raynald's venture. By the 13th century it was recorded that Kolzum was in ruins as was Suez which had gradually replaced the former as a population center. According to Muslim historians al-Maqrizi and al-Idrisi, Kolzum had once been a prosperous town, until it was occupied and plundered by Bedouins. Arab geographer al-Dimashqi noted that Kolzum belonged to the Mamluk province of al-Karak at the time. To prevent Portuguese attacks against Egyptian coastal towns and the Red Sea port of Jeddah, Qansuh al-Ghawri the last Mamluk sultan ordered a 6,000-man force headed by Selman Reis to defend Suez in 1507, which in turn limited the Mamluk military's capabilities against the Ottomans in the Mediterranean sea. Following the Ottoman's conquest of Egypt at the beginning of the 16th century, Suez became both a major naval and trading station. The Ottoman fleets at Suez were instrumental in disputing control with the Portuguese over Indian Ocean trade. German explorer Carsten Niebuhr noted that in the 18th century a 20-vessel fleet sailed annually from Suez to Jeddah—which served as the Islamic holy city of Mecca's port and Egypt's gateway for trade with India. However, by 1798, during Napoleonic invasion, Suez had devolved into an unimportant town. Fighting between the French and the British in 1800 left most of the town in ruins. 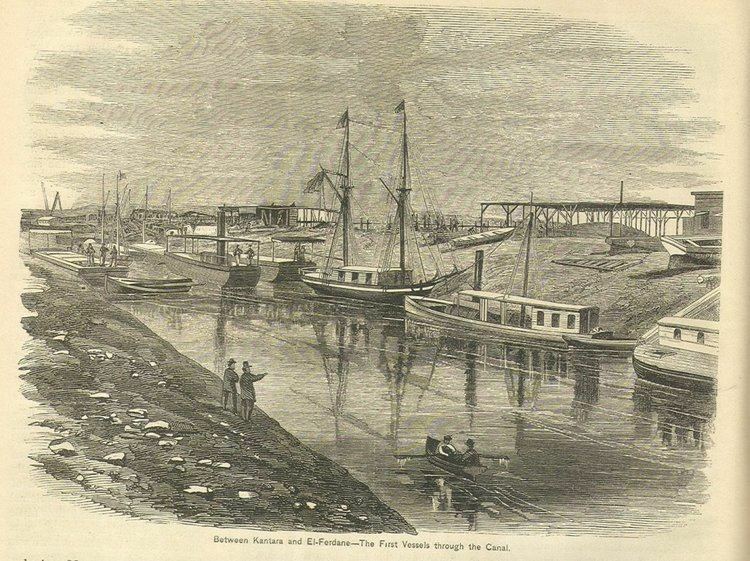 Its importance as a port increased after the Suez Canal opened in 1869. The city was virtually destroyed during battles in the late 1960s and early 1970s between Egyptian and Israeli forces occupying the Sinai Peninsula. The town was deserted following the Six Day War in 1967. Reconstruction of Suez began soon after Egypt reopened the Suez Canal, following the October War with Israel. Suez was the first city to hold major protests against the government of Hosni Mubarak during the 2011 Egyptian revolution and was the scene of the first fatality of that uprising. On account of this, it has been called the Sidi Bouzid of Egypt, recalling that small town's role in the 2010–2011 Tunisian revolution. It is most populous district of the city. It has most of the government buildings and public institutions. It also has the city's main fruit and vegetable markets in addition to other markets and stores selling various commodities. It is more modern than Arbaeen district in terms of how the buildings look. The real estate there is significantly more expensive than any other district in the city. Suez district is considered the most affluent area in the city. It includes the affluent neighborhood of Port Tawfik, which directly overlooks the Suez Canal. Port Tawfik includes some old-style houses that date back to the English colonization era. The district also includes two of Egypt's most important oil refineries; El-Nasr Petroleum Company and Suez Petroleum Company. Also, Suez Port, one of Egypt's main ports, lies within the perimeter of Suez District. That district stretches all the way to the border with Ismailia Governorate. It has all the rural areas of the city and can be thought of as the city's "countryside". It includes the newer neighborhoods of the city. Most of the areas at Faisal District were established after the 1973 war, which had destroyed vast areas of the city. Examples of Faisal District include Al-Sabbah, Al-Amal and Al-Mushi, to name a few. It is characterized by the existence of many industrial areas. Plants and factories working in various fields are located in that District. There are factories specialized in fertilizers, cement, steel, cooking oil, flour products, oil rigs, ceramic tiles, sugar, and many other products. There is also Attaka Power Plant. The district also includes Ain Sokhna, one of Egypt's most important sea resorts, overlooking the Gulf of Suez. Ain Sokhna has got numerous high-class sea resorts and is frequented by many tourists, Egyptians and foreigners, all over the year due to its warm weather. The district is also home to Ain Sokhna Sea Port, one of Egypt's main sea ports. The port is operated by the Dubai-based DP World Company. Also, the district includes Al-Ataka Fishing Port, which is the city's main fish production port. The Suez Canal offers a significantly shorter passage for ships than passing round the Cape of Good Hope. The construction of the Suez Canal was favoured by the natural conditions of the region: the comparatively short distance between the Mediterranean and the Red Sea, the occurrence of a line of lakes or depressions which became lakes (Lake Manzala in the north, and depressions, Timsah and the Bitter Lakes, part way along the route), and the generally flat terrain. The construction of the canal was proposed by the engineer and French diplomat Ferdinand de Lesseps, who acquired from Said Pasha the rights of constructing and operating the canal for a period of 99 years. The Compagnie Universelle du Canal Maritime de Suez was formed. Construction took 11 years, and the canal opened on 17 November 1869. The canal had an immediate and dramatic effect on world trade. In July 1956, just a few days after the fourth anniversary of the Egyptian Revolution of 1952, the Egyptian government under President Gamal Abdel Nasser nationalised the Suez Canal Company, which had been run by the French and owned privately, with the British as the largest shareholders. The Israeli-British-French invasion of Egypt which followed is known in Egypt as the Tripartite Aggression but elsewhere as the Suez Crisis. Following Israel's invasion and occupation of Egypt's Sinai Peninsula in the Six Day War of 1967, the Canal was closed, and did not reopen until 1975. Today, the Canal is a vital link in world trade, and contributes significantly to the Egyptian economy; in 2009 the income generated from the canal accounted for 3.7% of Egypt's GDP. Köppen-Geiger climate classification system classifies its climate as a hot desert (BWh). The hottest recorded temperature was 49 °C (120 °F) on June 14, 1965 while the coldest recorded temperature was 1 °C (34 °F) on February 23, 2004.